First we heard the tinkling of their bells, then we spied the sheep living two back yards from our house in the old Maltese town of Haz Zebbug. And on our last day we were lucky enough to taste the cheese made from their milk by our neighbour, Connie. Connie makes and sells Gjebjniets with the milk from her four sheep. A simple fresh cheese made from milk, salt and rennet in small basket-shapes, Gbejna are made from sheep and sometimes goats milk across the Maltese islands. Our host, Mariella had recommended I ask our neighbour, Connie, if I could buy some of hers after she’d read that I was a cheese fiend on my AirBnB profile. Just knock on the brown door Mariella had said, and ask to buy some. Mariella recommended eating them for breakfast on some bread from the wood-fired bakery at the end of the street. Connie offered us tomatoes from her garden and eggs from her hens. Together they made a most delicious breakfast on our last day in Malta. 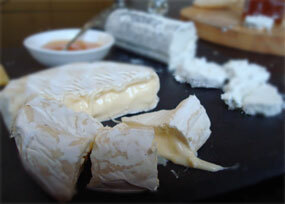 Gracious and welcoming, Connie had made the cheeses that morning and would usually sell them the next day in Mdina. I was was so excited to meet her. Her cheeses were so fresh she recommended adding a little salt. They were like soft pillows of sweet milk barely hovering between liquid and solid. Like marshmallows described my friend Bronwyn. The Maltese eat these little cheeselets fresh, semi-dried, brined, and peppered. They are used in many ways, fresh on the local bread, in ravioli, or in the delicious cheese pies that are ubiquitous on the island. These beautiful diamonds of filo-like pastry with fresh, ricotta-like filling are called Pastizz, and are available from the Pasitzzerias which are common all across Malta. We’d munched on some the night before as we meandered home from the local festival in Haz Zebbug celebrating Independence Day. We’d also eaten the semi-dried version crumbled feta-like over a salad and on antipasto platters, and I’d even encountered a cheeselet in a “Patriot” burger Maltese-style. Thank you Mariella, Connie and Connie’s sheep, our final meal in Malta summed up our marvellous stay on your Islands, plenty of good company, food, sun and happy bellies all round. A suprise about the sheep next door and the wonderful local people and their cheeses! The people in Malta were great. They seemed a bit disinterested in tourists, but once you engaged with them they were very lovely. Love it! The bells bells. This reads really well my lady – looking forward to the book version. Does Roger have a football and craft beer version?